Purpose: To review the mechanisms of action and clinical applications of bisphosphonate drugs, which are widely used in the management of metastatic bone cancer and systemic metabolic bone diseases, as well as the complications related to bisphosphonate treatment, emphasising the occurrence and management of bisphosphonate-related osteonecrosis of the jaws (BRONJ). Materials and Methods: A search of the medical and dental literature was conducted in Medline and Embase using a combination of the key words bisphosphonates, jaw, complications, osteonecrosis, osteoporosis and periodontal disease. A manual search of the references of the retrieved articles was also performed. Results: BRONJ predominantly affects cancer patients being treated with high-dose intravenous bisphosphonates and is characterised by the appearance of necrotic bone in the oral cavity either spontaneously or following an invasive surgical procedure such as dental extraction. The severity of this condition warrants a thorough medical and dental history in every patient in order to identify high risk patients. Conclusion: It is important that dental practitioners be aware of the association between bisphosphonate treatment and osteonecrosis of the jaws. Clinicians should perform a thorough oral examination in cancer patients before they begin intravenous bisphosphonate treatment. Optimal oral hygiene and regular dental care can lower BRONJ risk. Further clinical research is necessary to unveil the full therapeutic potential of bisphosphonates, their mechanisms of action and the factors that induce unwanted side-effects. Purpose: To compare the efficacy of chlorhexidine, Persica mouthwash and electric toothbrushes in improving gingival enlargement in patients with fixed orthodontic appliances. Materials and Methods: Seventy-two orthodontic patients with at least two sites of gingival enlargement were randomly allocated into four equal groups: 1) manual toothbrush; 2) electric toothbrush; 3) manual toothbrush + Persica mouthwash; 4) manual toothbrush + chlorhexidine mouthwash. All participants were instructed to brush their teeth at least twice a day. The subjects in groups 3 and 4 were instructed to use Persica or chlorhexidine according to the respective manufacturer's instructions. Bleeding on probing (BOP) index, gingival index (GI), O'Leary's plaque index (PI) and constructed hyperplastic index (HI) of all the subjects were measured in a blind manner at the start of the study and 2 weeks later. Changes of indices in the entire oral cavity and individual affected teeth were analysed with SPSS 16 using chi-square, ANOVA, ANCOVA, LSD and the paired t-test. Results: In the entire oral cavity, there was a statistically significant improvement in indices in all the groups except for HI, which significantly improved only in group 4 (p = 0.001). Data of individual teeth with hyperplastic gingiva showed significant reduction of all the variables except for HI in group 1 (p = 0.08). No significant differences were found between groups 1 and 2 or between groups 3 and 4. Conclusion: The efficacy of Persica was similar to that of chlorhexidine in improving gingival conditions. None of the treatment modalities could reduce gingival enlargement to the clinically acceptable level of health. Purpose: To compare the efficacy of an Aloe vera mouthwash with a benzydamine mouthwash in the alleviation of radiation- induced mucositis in head and neck cancer patients using a triple-blind, randomised controlled trial. Materials and Methods: Twenty-six eligible head and neck cancer patients who were to receive conventional radiation therapy at the radiation oncology department were randomised to receive an Aloe vera mouthwash or a benzydamine mouthwash. Mucositis severity was assessed during the course of radiation therapy using the WHO grading system. Results: At baseline, there was no difference in the distribution of mucositis severity between the two groups. The mean interval between radiation therapy and onset of mucositis was similar for both groups (Aloe vera 15.69 ± 7.77 days, benzydamine 15.85 ± 12.96 days). The mean interval between the start of radiation therapy and the maximum severity of mucositis were was also similar in both the Aloe vera and benzydamine groups (Aloe vera 23.38 ± 10.75 days, benzydamine 23.54 ± 15.45 days). Mean changes of mucositis severity over time in both groups were statistically similar and the effect of both treatments did not change signficantly with time (p = 0.09). Conclusion: Aloe vera mouthwash was as beneficial as benzydamine mouthwash in alleviating the severity of radiationinduced mucositis and showed no side effects. The Aloe vera mouthwash could be an alternative agent in the treatment of radiation-induced mucositis in patients with head and neck cancers. Auschill, Thorsten M. / Schmidt, Kristina E. / Arweiler, Nicole B. Purpose: To determine whether fluorosed areas of teeth can be successfully treated with resin infiltration and whether the results are long lasting. Materials and Methods: For the present case of mild to moderate dental fluorosis, the microinvasive resin infiltration technique was chosen, following suboptimal results of in-office vital tooth bleaching to improve the aesthetic appearance of the affected teeth. Results: Six months after treatment, the white opaque and brown discolourations remain masked. Conclusion: This case report demonstrates that resin infiltration is an agreeable option for this type of tooth discolouration, rather than choosing more invasive, conventional procedures. More studies need to be completed to determine longer-term outcomes of the technique. Purpose: To examine the relationship between oral health literacy and oral health by adapting a valid oral health literacy instrument. Materials and Methods: A random sample of 715 students from 9 institutes was included in the study. Oral health literacy (OHL) was assessed by making the students pronounce a list of 40 words from REALD-99. Oral health status (OHL) was assessed using a modified WHO (1997) proforma. 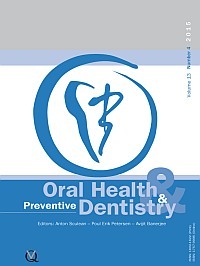 A stepwise logistic regression analysis was performed to assess the impact of independent factors on oral health literacy. Results: The response rate was 97.9%; 15 students refused to participate, leaving 700 participants in the final sample. The mean age of the participants was 20.35 ± 1.66 years. A statistically significant difference was observed in OHL according to the clinical parameters. Caries prevalence was higher among subjects with low OHL with a mean DMFT score of 2.69 ± 1.53, compared with high-OHL students having a mean DMFT of 0.22 ± 0.4. Similarly, oral hygiene status was poor among subjects with low OHL (1.53 ± 0.6). Community periodontal index (CPI) scores were lower (1.06 ± 0.8) in subjects with high OHL than in those with low literacy (CPI: 1.6 ± 0.6). Conclusion: The present study revealed a negative correlation between oral health literacy and clinical parameters measured, that is, higher oral health literacy was associated with better oral health. Purpose: To examine oral health related behaviours in relation to anxiety, depression and attention deficit hyperactivity disorder (ADHD). Materials and Methods: This study included 364 subjects (195 female, age range 19-65 years; 169 male, age range 18-64 years). A psychological evaluation was performed using Beck's anxiety, Beck's depression and ADHD scales. A separate questionnaire covering oral health behaviours, including parafunctional habits, dental visits and toothbrushing frequency, was given to the subjects and completed before the clinical examination. The numbers of decayed, missing and filled teeth were recorded and the status of the subject's periodontal health was determined clinically using periodontal probes and panoramic radiographs. Results: There were significant differences in the gender, level of education, level of income, household size, parafunctional habits and number of missing teeth in those with anxiety and depression (p < 0.05) vs those without. Females and subjects with parafunctional habits and lower education and income level presented higher anxiety and depression scores. ADHD was associated negatively with household size and positively with dental visits and toothbrushing frequency (p < 0.05). The results of structural equation modeling (SEM) revealed that anxiety, depression and ADHD were indirectly related to missing teeth and periodontal status: subjects with higher depression and anxiety scores had more missing teeth and worse periodontal health. However, there was no association between psychological factors and decayed teeth or toothbrushing frequency. Conclusions: Anxiety, depression and ADHD can result in poor oral hygiene, thereby having indirect, adverse effects on the periodontal health status of affected individuals. Although the frequency of dental visits seemed to be related to anxiety and ADHD, the frequency of toothbrushing showed no such association. Purpose: To assess and compare the antimicrobial potential and determine the minimum inhibitory concentration (MIC) of Jasminum grandiflorum and Hibiscus rosa-sinensis extracts as potential anti-pathogenic agents in dental caries. Materials and Methods: Aqueous and ethanol (cold and hot) extracts prepared from leaves of Jasminum grandiflorum and Hibiscus rosa-sinensis were screened for in vitro antimicrobial activity against Streptococcus mutans and Lactobacillus acidophilus using the agar well diffusion method. The lowest concentration of every extract considered as the minimum inhibitory concentration (MIC) was determined for both test organisms. Statistical analysis was performed with one-way analysis of variance (ANOVA). Results: At lower concentrations, hot ethanol Jasminum grandiflorum (10 μg/ml) and Hibiscus rosa-sinensis (25 μg/ml) extracts were found to have statistically significant (P ≤ 0.05) antimicrobial activity against S. mutans and L. acidophilus with MIC values of 6.25 μg/ml and 25 μg/ml, respectively. A proportional increase in their antimicrobial activity (zone of inhibition) was observed. Conclusion: Both extracts were found to be antimicrobially active and contain compounds with therapeutic potential. Nevertheless, clinical trials on the effect of these plants are essential before advocating large-scale therapy. Elmazi, Valbona / Sener, Beatrice / Attin, Thomas / Imfeld, Thomas / Wegehaupt, Florian J. Purpose: To determine the influence of the relative enamel abrasivity (REA) of fluoridated toothpaste on the uptake of KOH-soluble and structurally bound fluoride into enamel. Materials and Methods: Bovine enamel samples were randomly allocated to 6 groups (n = 36 per group). Groups A to C were treated with sodium fluoride (NaF) toothpastes and groups D to F with amine fluoride (AmF) toothpastes (1500 ppm F each). The REA in groups A and D was 2, in groups B and E it was 6 and in groups C and F it was 9. Twice a day, 18 samples of each group were immersed for 2 min in a slurry (toothpaste:artificial saliva = 1:3), while the remaining samples were brushed with the respective slurry (2.5 N force; 60 strokes/min; 2 min). All samples were stored at 37°C and 100% humidity. After five days, the amount of KOH-soluble and structurally bound fluoride was determined and statistically compared by Scheffe's post-hoc tests. Results: REA value and mode of application (immersion or brushing) had no significant influence on the amount of either kind of fluoride from NaF toothpastes. Only for the NaF toothpaste with REA 6 was the amount of KOH-soluble fluoride significantly higher after brushing. With AmF toothpastes, KOH-soluble and structurally bound fluoride concentrations were significantly higher when the samples were brushed. Furthermore, in the REA-2 group, the amounts of KOH-soluble fluoride (brushed or immersed) and structurally bound fluoride (brushed) were significantly higher than in the other groups. Conclusion: The REA dependency of KOH-soluble and structurally bound fluoride was found only for the AmF toothpastes. Using AmF toothpaste, the mode of application influenced the uptake of KOH-soluble and structurally bound fluoride into enamel. Purpose: To evaluate elementary schoolteachers' knowledge and decision making regarding dental trauma in Porto Alegre, Brazil. Materials and Methods: A questionnaire-based survey was conducted among elementary schoolteachers (n = 442). Questions encompassed sociodemographic characteristics and decision making regarding dental trauma. Data on the appropriate answer regarding what to do with a traumatised or avulsed tooth were analysed with multiple logistic regressions, adjusting for age, gender, work experience and previous training. Results: The study population consisted largely of women (90%), was 40 to 49 years old (44.3%) and had more than 15 years of work experience (56.6%). Women (OR = 2.68/p = 0.041), teachers under 30 years old (OR = 4.95/p = 0.041), those with more than 15 years of work experience (OR = 8.95/p < 0.001) or those who had already received previous dental trauma instructions (OR = 1.95/ p = 0.119) were more likely to choose the appropriate answer for an avulsion situation. Teachers under 30 years old (OR = 2.88/ p = 0.279), those with more than 15 years of work experience (OR = 4.55/p = 0.001) or those who had received previous training (OR = 3.39/p = 0.009) presented higher probabilites of choosing the appropriate answer for a crown fracture event. Conclusion: Greater work experience or previous instructions on how to approach dental trauma in the school environment were found to be major factors in schoolteachers' decision making regarding dental trauma. Purpose: To examine the as yet unknown relationship between dental caries and the child's psychomotor development. Materials and Methods: A cross-sectional study was designed by screening the kindergartens from urban areas of two cities in southern Taiwan. Besides the personal, demographic and dietary information, the common measures for caries (dmft) and the amended comprehensive scales (CCDI) for psychomotor development were used to assess their relationship(s). A power analysis showed that 334 subjects would be required. One-way ANOVA vs multiple linear regression analysis were used to compare the differences of variables between gender, age and dmft scales, vs the relationship among all variables tested, respectively. Results: A total of 433 children completed the study. The results demonstrated that there was a positive relationship between higher (i.e. dmft ≥ 4 and 5) but not lower or extremely high caries experience and aspects of psychomotor development (i.e. personal-social and expressive language) in children aged 4 to 6 years. Conclusion: The present results are important for paediatric dentists, as they suggest a positive correlation between caries experience (dmft 3 to 6) and psychomotor development in pre-school children and that such a correlation may occur more significantly as an attribute of the most affected teeth (incisors and molars) during the critical stage of personal-social and expressive language development (speech-communication).